The Chelm Project is a pro bono endeavor. Your donation is greatly appreciated. Your support helps balance overly conflict-driven news that warps perceptions of Israel. Are you a Publisher or Literary Agent? Beyond life and death issues, Israel is an outrageously amusing and lively place to live, and it’s strange that Jews, famous for their humor from Charlie Chaplin to Seinfeld, haven’t a clue about the humorous side of Israeli life. Take a look at Reuters’ “Oddly Enough”. Or USA Today’s “Offbeat”. Or the bestseller The Darwin Reports. They…and a host of other newspapers, wire services, websites and books all cull and collect the silly, the outrageous and even incredibly stupid things people do that ‘unite humanity’. But Israel rates only an occasional mention. The best man-bite-dog and back-page news is only reported in the Hebrew press. (Some Israelis, no doubt, sigh with relief…) The fact is, we Israelis do countless equally unbelievable, innovative, nutty or chutzpadik life-embracing things – many that could happen only in Israel. I believe every Israel Watcher and any connoisseur of ‘news of the weird’ deserves to savor these snippets of daily life. 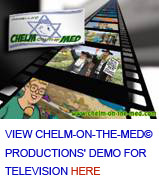 That’s why this piquant news service – CHELM-ON-THE-MED© was launched. While there is not one kernel of authenticity in traditional Chelm tales, it should be emphasized: As unbelievable as it may seem at times, I’m not making this up! Not even exaggerating! All the stories on this website are based on facts published in genuine news items that appeared in the Hebrew press in periods of relative quiet and in wartime alike – all gleaned from Israel’s largest Hebrew daily – Yediot Aharonot, unless another news source is stated. Yet, I’m convinced that readers will be laughing with us, not at us. Copyright © Daniella Ashkenazy. All rights reserved worldwide. For limited usage, see FAQs. All stories are completely rewritten by Daniella Ashkenazy from news items gleaned from Yediot Aharonot, unless another news source is stated.